The 82nd Annual Academy Awards on Sunday is Hollywood's biggest event. And everyone wants to know who will walk away with gold. But who is actually going to win? Dalton Ross, assistant managing editor of Entertainment Weekly magazine, shared his Oscar predictions and discussed some of the big controversies surrounding this year's awards. This year 10 movies were nominated for Best Picture, a move that Ross called a "ratings grab." He explained, "Oscar telecasts tend to do well when there are big, huge popular films among the nominees. The past few years, however, the majority of nominees have tended to be much smaller films, which means a less interested audience." Ross said, while "Avatar" definitely would have made the field of five nominees, you know also have big films like "The Blind Side," "Inglourious Basterds," "District 9" and "Up in the Air," which may not have. Photos: "Up in the Air"
Ross said the additional nominees have eaten up time in the telecast, but the awards show, has made up that time by getting rid of all the Best Song nominee performances, as well as the lifetime achievement awards, which were moved to a separate ceremony. Awards shows are rarely without controversy, and this year, one film, "The Hurt Locker," has come under fire for more than one reason. According to Oscar officials, a producer of the Iraq war story will not be allowed to attend the awards ceremony because of e-mails he sent urging academy members to vote for his movie. "The Hurt Locker" may also be sued by a bomb disposal expert who served in the Iraq war. He claims the film's lead character is based on him and that he's being cheated by filmmakers out of "financial participation in the film." Ross says the controversies will not likely affect the film's chances of winning, citing the previous year's issues with child actors in "Slumdog Millionaire," which won the Best Picture statue. "It didn't cost that movie at all," he said. "Plus, most of this came out after the majority of voters had already filed their ballots, so if 'Hurt Locker' does not win, I wouldn't jump to the conclusion that is necessarily the cause." As for the actual winner of the category, Ross says "Avatar" has his vote. He said, "'Avatar' did something that a movie hasn't done in a long time, made audiences stare at the screen, open their mouth and say "wow." For that, it gets my vote, but I think the momentum that 'Hurt Locker' has achieved with all its critics awards may just be too much." Ross continued, "Plus, with the new weighted voting system, I think that helps 'Hurt Locker' in that 'Avatar' -- some people love, and others not so much -- so it could be pretty low on some ballots." In the Best Director category, James Cameron is Ross' projected winner. 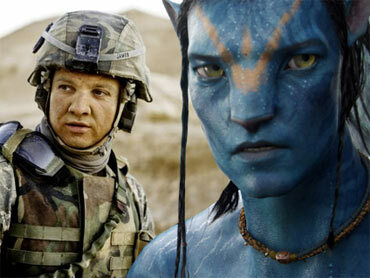 The director of "Avatar," he said, created an "incredible spectacle and achievement." However, he added, the actual winner will likely be Cameron's ex-wife Kathryn Bigelow, director of "Hurt Locker." Ross said, "(It) would make her the first female Best Director winner ever, and also makes her pretty hard to root against." In the Best Actor category, Ross predicted Jeff Bridges for "Crazy Heart." "(Bridges) has had a remarkable, wide-ranging career and has really become the sentimental choice for that reason. But it's not the only reason," he said. "He's simply fantastic as a washed-up alcoholic country star. Not only is he the sentimental choice, but he's the right choice. I think he should and will win." For Best Actress, Ross says Meryl Streep was the early frontrunner for her "pitch-perfect portrayal" of Julia Child. "I still think she's the best in the field," Ross said. However, Sandra Bullock's performance in "The Blind Side," he said has come on strong. "I think the fact that the 'Blind Side' got a Best Picture nomination only helps her and probably gives her the slight edge," he said. "If Bullock does win, it means that Streep, who has the record with 16 acting nominations, would be 0-12 since her 1983 win for 'Sophie's Choice.'"